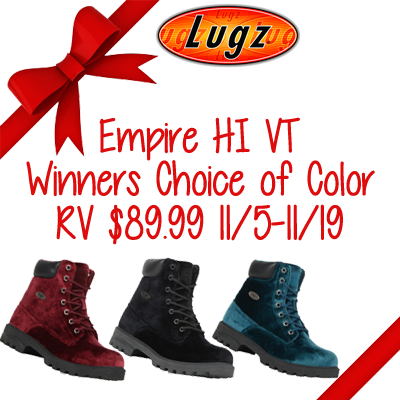 Love, Mrs. Mommy: Lugz Empire HI VT Boots! $89 RV! Lugz Empire HI VT Boots! $89 RV! These great boots could be yours if you enter today! Winners choice of color! Though I am a traditionalist when it comes to shoes usually I think I would choose red this time to spice things up a bit :). I think the Teal/Black ones will be stylish for this Winter. I love the Teal! Pretty colors!! I'd choose the black color! I love the Teal/Black boots. So cool and unique. I would choose black. Thanks so much for the chance! I never had boots like these but have been wanting this for a long time! Good luck to everyone! I would choose the black so that I could wear them with anything.